Spring is just about here in Norcal (we hope), and we are very excited to say goodbye to winter. It is almost time to get back in the garden and orchard, clean up the grill and smoker and spend some more time outside. And baseball opening day is just weeks away, sigh… But we aren’t quite there yet, so we are still eating winter veggies and making the most of our citrus. And this turnip salad recipe, while having a very light spring flavor, is very much a winter-ingredient dish. And before you say “yuck, turnips”, we want to suggest you keep an open mind about the Tokyo or Hakurei turnip. These turnips are smaller, lighter, thinner skinned and crisper than your average turnip, in fact Tokyo turnips are very good in raw preparations and salads. And you don’t have to take our word for it, our boys and a friend tried, and loved, these turnips. If you can get kids to eat turnips you know you are onto something good. 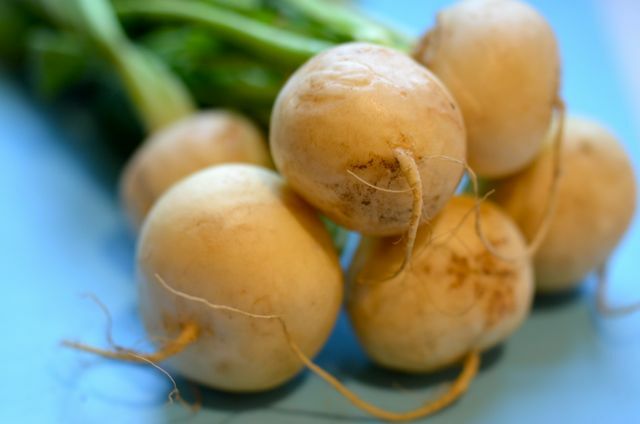 Tokyo turnips are a trendy ingredient these days, but are still uncommon in many supermarkets, you may have to go to a farmers market or Asian produce market to find them, but it is worth the effort. While we are big fans of Tokyo turnips, they are a winter vegetable and do need a bit of extra work to really shine. And if we can make one generalization about winter vegetables is that they can be as good, and sometimes better, than spring or summer veggies, but usually there are a few extra steps to bring out the best flavors and textures. And this recipe is no exception. We adapted the recipe from Kevin Gillespie, Chef at Atlanta’s Woodfire Grill and Top Chef contestant. He recently wrote a cookbook “Fire In My Belly” and we have been working our way through the book (so far, so good). While many of the recipes are southern-influenced, Gillespie is a big advocate for local, organic food and this recipe comes more from that part of the book. 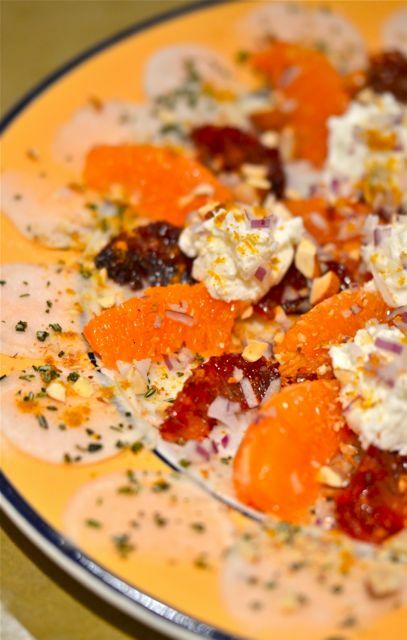 This salad combines marinated turnips with orange and blood orange supremes, a goat cheese and horseradish mixture and roasted nuts (Gillespie uses hazelnuts, we like almonds). While we simplify the recipe somewhat, we do keep some of the core techniques in place. 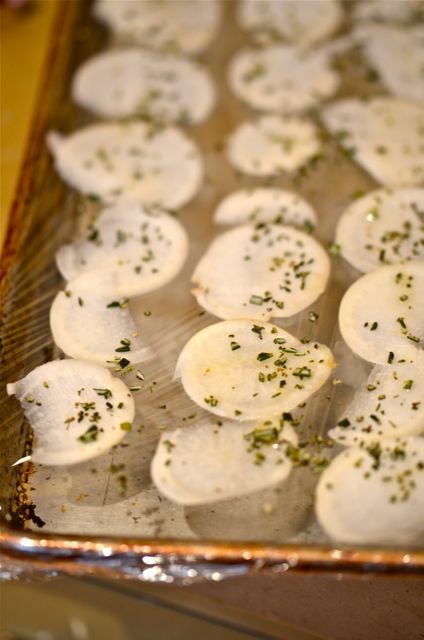 The main trick here is to thinly slice the turnips and marinate them between two layers of plastic wrap. This may seem fussy (and you can skip it if you like) but this technique creates almost a vacuüm seal and really gets the flavor into the turnips. Worth a try. The other cool trick is to add some sour cream and prepared horseradish to the goat cheese, it adds real depth of flavor and the extra zip of the horseradish plays very well with both the turnips and oranges. A tiny dusting of curry powder at the end is also a nice touch and adds a little extra flavor and aroma. In the end, you get a very satisfying salad with vegetal, spicy, sour and sweet flavors along with crisp, crunchy and creamy textures. In other words, a complete dish. This salad is great as a side and could even be the base of a light lunch. And while the recipes does take extra work, all the steps are easy, you just need to spend the added time. And since this dish is good enough to get kids to happily eat turnips, we thing it s time well spent. Tokyo or Hakurei turnips are small, white thin-skinned turnips you can find at farmers markets and some produce stands. There is not a direct substitute but use baby turnips if you cannot find Tokyo turnips. 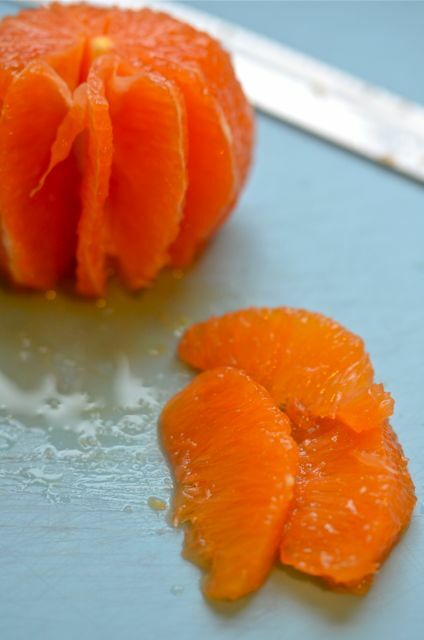 “Supremes” are simply wedges of citrus you cut from between the membranes (see photos). Cutting supremes is messy and takes a few minutes, but makes for better presentation and eating. Here is a good photo series. What You Get: A very flavorful raw salad that makes the best of turnips. 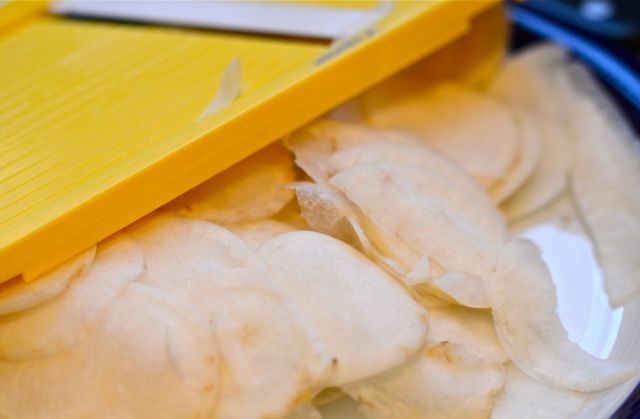 What You Need: No special equipment required, but the thinner the turnip slices, the better. 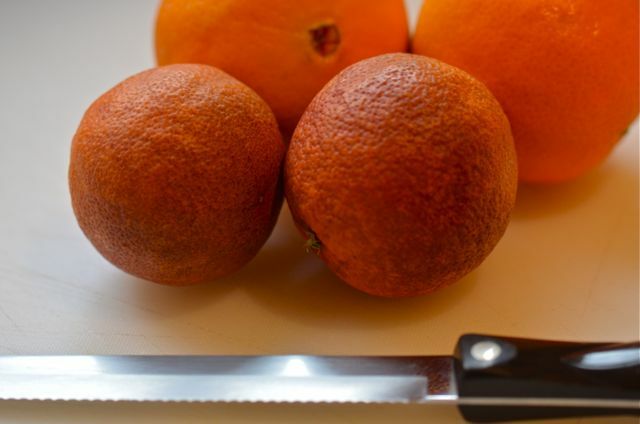 A small hand-slicer or mandolin will be a big help. How Long? About 30-40 minutes with 20+ minutes of active time. It takes extra time to get the best of winter veggies, but this is still an “anytime” dish. Preheat your oven to 300 degrees. 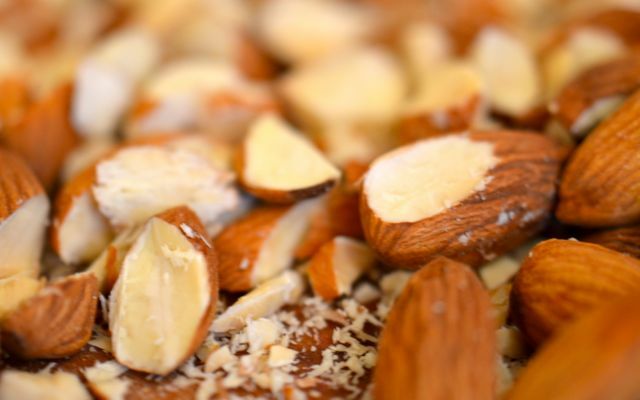 Spread the almonds on a baking sheet and toast until fragrant, about 8-10 minutes. Remove from the oven and allow to cool. Then coarsely chop. Peel the oranges with a knife and cut supremes from each orange (see notes) place the supremes on a plate but reserve the peel, and squeeze the juice from the membrane into a bowl. Wash the turnips, cut off their tops and rub off any rough patches of outer skin with a kitchen scrubber or towel. Slice the turnips, as thinly as you can, with a mandolin, hand-slicer or very sharp knife. Tightly stretch a layer of plastic wrap on a baking sheet. Then lay the turnip slices, in a single layer, on the plastic wrap. Sprinkle on the rosemary, then squeeze the orange peels and a few sprinkles of orange juice onto the turnips. Drizzle on some honey and lightly season with some salt. Then stretch another layer of plastic wrap on top of the turnips to form a seal. Let the turnips marinate for 10-15 minutes. They will soak in flavor and soften. 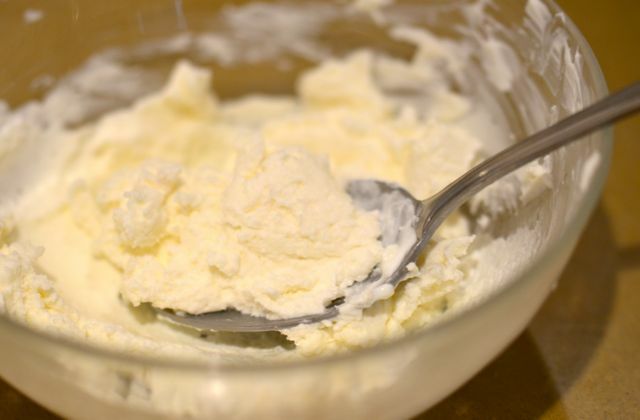 In a small bowl, combine the goat cheese, sour cream, horseradish and a pinch of salt. Mix until smooth, taste and adjust the salt if needed. To assemble the plate, layer on or “shingle” the turnip slices. 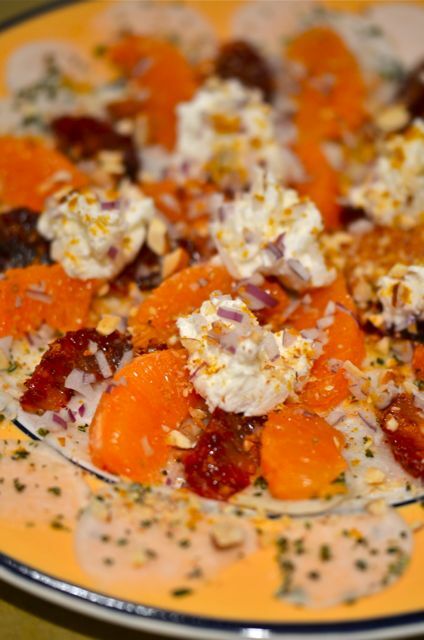 Sprinkle on the orange segments and then add in dollops of the goat cheese mixture. Garnish with some of the onion, the chopped almonds and a light dusting of the curry powder. Season with salt and pepper, if you like. Serve. All hail the Hakurei!! My favorite too! They’re sweet and crunchy and don’t get that daikon-radish-gone-wrong kind of bite to them. Like, ever. This looks yummlie! Can’t wait to shingle me some Hakurei! This sounds wonderful and refreshing! I’m sure the marinated sliced turnips are delicious. Such a nice idea for a winter/spring salad! I’m impressed with the precision cuts! Thanks! 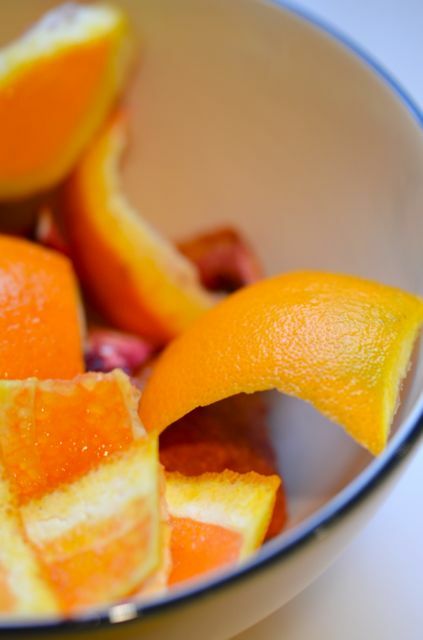 The blood oranges always make everything look beautiful. A big green egg- works pretty well…can’t wait to get back to it..
Wow. How innovative, this looking incredible. What a unique way to fix turnips. Never been a fan but this salad may change that. Woah. That looks amazing! I would never have thought of such a delicate use of turnips. Thanks. Frankly, neither had we (and we are veg gardeners) but this is a very good recipe…worth a try. Wow, how elegant this looks! I doubt I get fancy turnips from our CSA farm share, but I do get baby turnips and would love to try this. Really unusual! I enjoy turnips with a whole lot less flair, so this is fabulous! This looks dee-lish! I love that it has oranges, too. I’ve never tried Tokyo Turnips before… Thanks for the tip! They are worth looking for- more like a good radish or daikon…tasty raw or cooked. I love those turnips! I can’t wait till they come in out here so I can try this. Looks great! Thanks- hope you enjoy the dish. The Tokyo turnips are worth looking for.